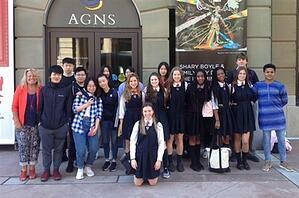 The Grade 10 Art Class visited the Art Gallery of Nova Scotia on Wednesday, May 9th. We had the opportunity to view a few of the visiting exhibitions. The exhibit The Light Fantastic was very popular -- the artists worked in neon light, video, print, paint and photography. This show was influenced by a line in one of John Milton’s poems of 1645. Other exhibits that we visited included: Transatlantique: The Art of Fashion and Costume Design in Paris and Halifax; Shifting Grounds, and Hiroshige: The Fifty-Three Stations of the TŌKAIDŌ. To check out other Art Gallery of NS exhibitions Click here. After a very inspiring day, we had lunch at the Halifax Shopping Centre. Thank you for an incredible day.